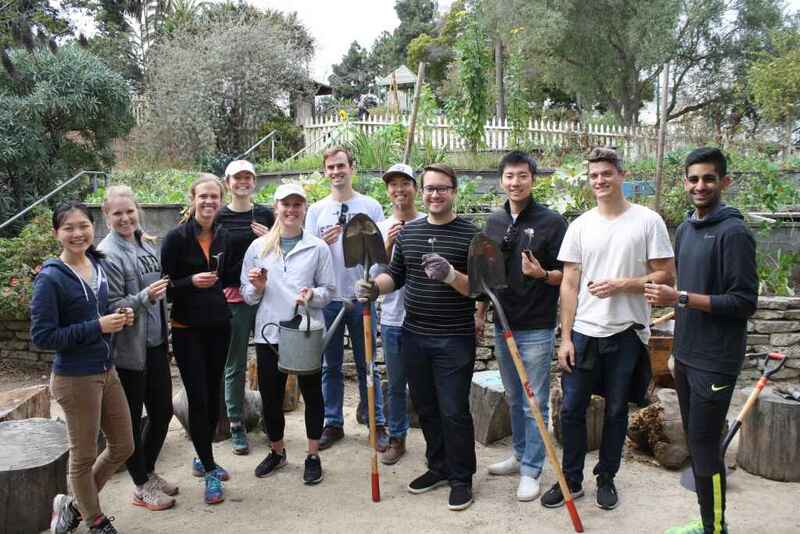 Last Friday, Bain and Co. joined CommunityGrows for a workday in Koshland garden! 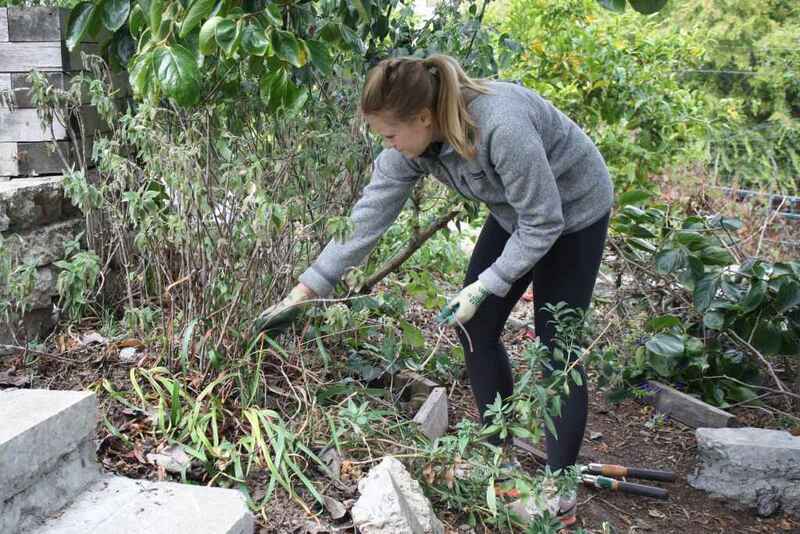 Though a bit overcast, the team jumped into the task list for the day and gave the garden a makeover, just in time for the start of classes. 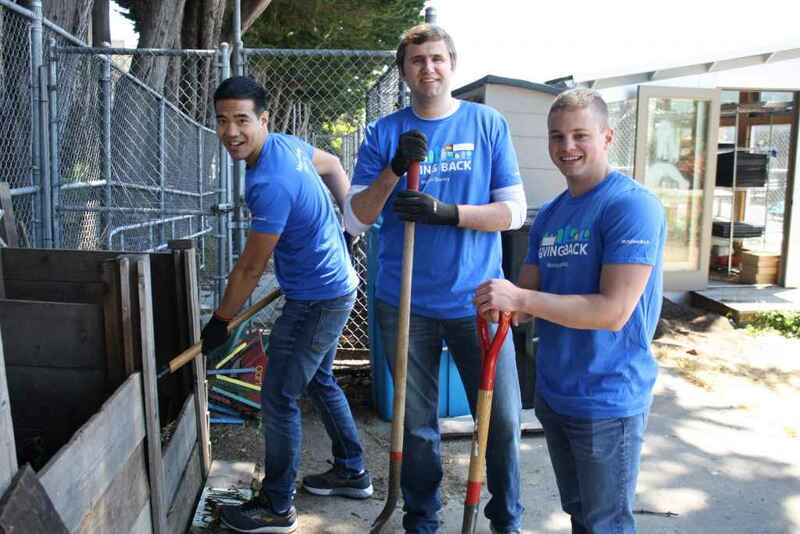 Read more about their workday below! 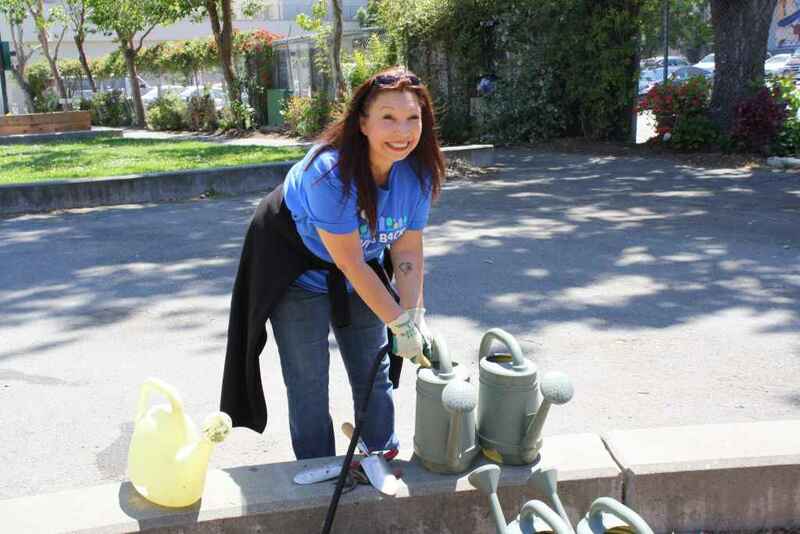 The day started with a group activity led by Garden Programs Manager, Anna. 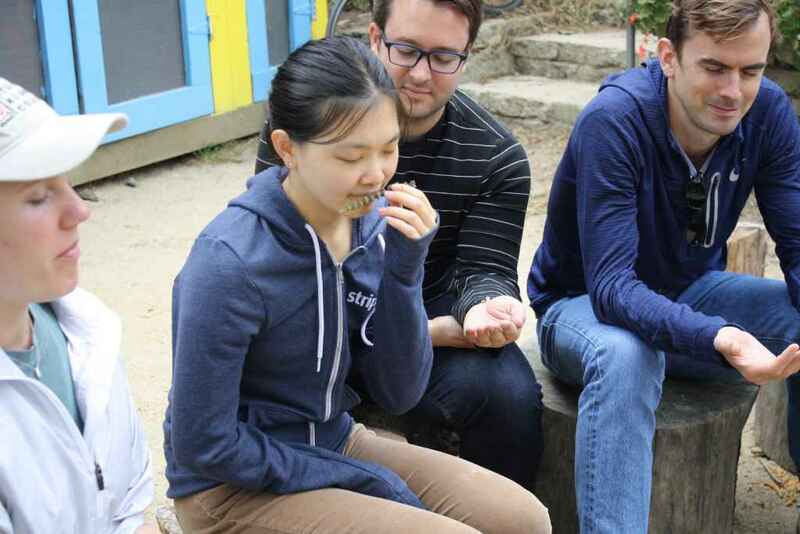 One of her favorite activities to do with the kids, Anna had everyone close their eyes and smell an herb as it was passed around the circle. Once everyone had the scent, they went into the garden to find the mystery plant. 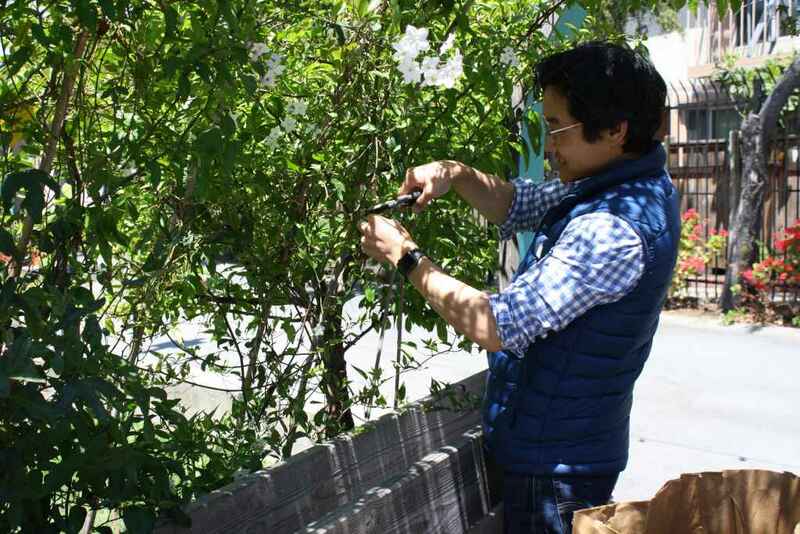 The activity not only gives students a tour of the garden space, but it also sharpens their observational skills. The team was able to identify and find both the basil and thyme! Well done, everyone! 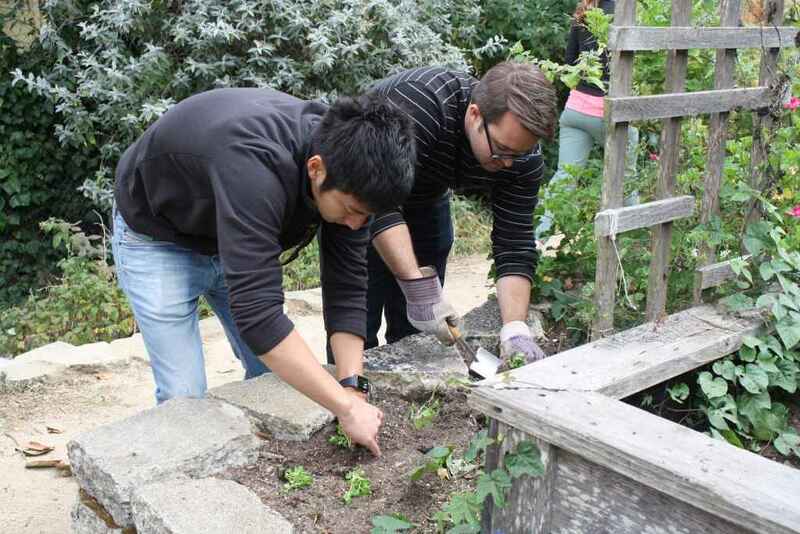 The group then broke into 3 teams to tackle some garden projects. 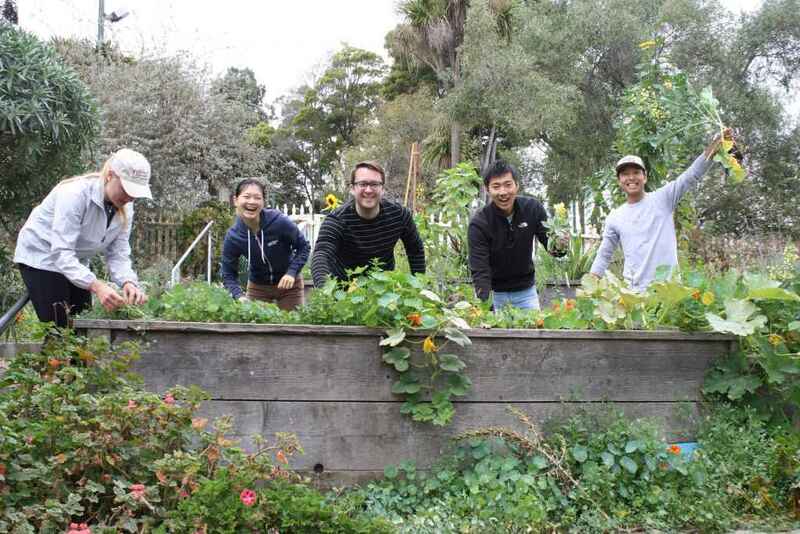 Two teams worked on weeding and clearing sections of the garden to make room for new seedlings while a third team worked on pruning the fruit trees and raspberry bushes. 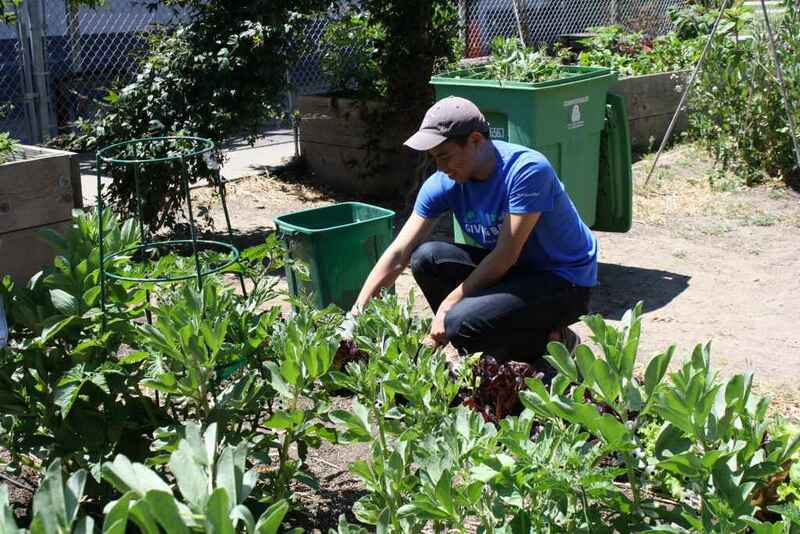 We also had a few volunteers sifting and flipping compost! The workday ended with everyone planting lettuce starts and peas in the newly cleared beds and covered by the newly sifted compost! By the end of the workday, the garden had a complete facelift. Everything looks beautiful and ready for the Fall classes. Thank you to Bain and Co. for volunteering in the garden and supporting our programs! We hope to see you in the garden again soon! Summer is now upon us! 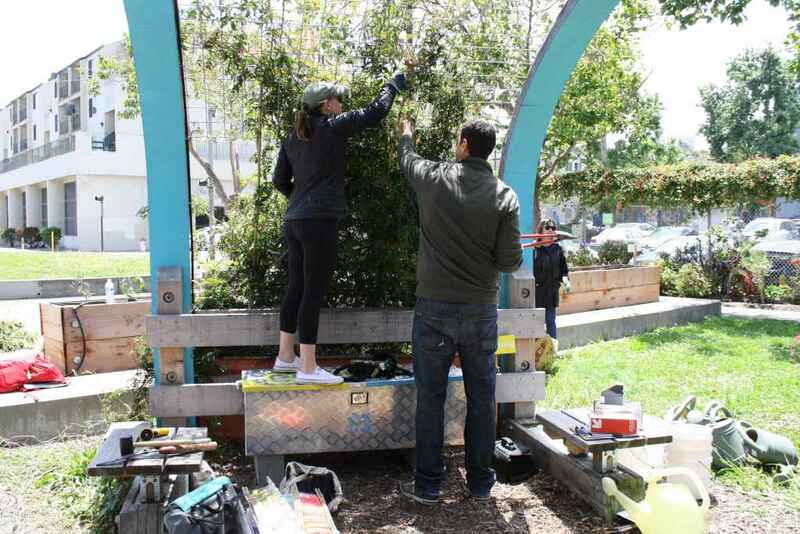 As educators have come to know, the warm weather signals not only some well deserved vacation time, but also an opportunity to catch up with projects that were put on the back burner during the busy school year. 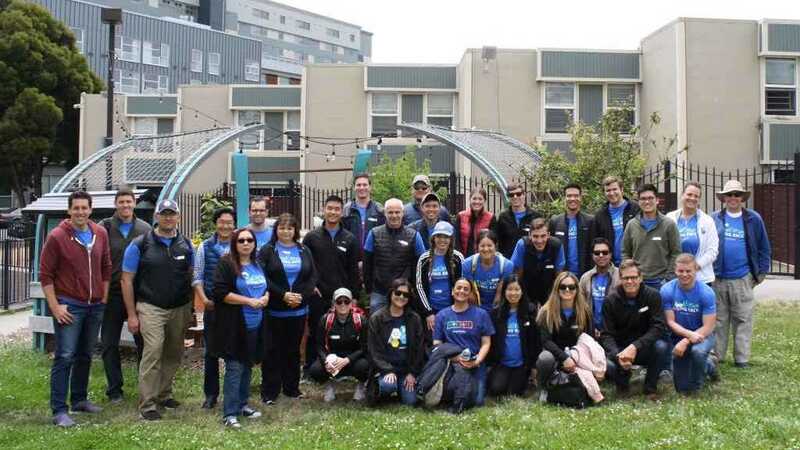 Last week, two teams from Morgan Stanley volunteered with CommunityGrows staff to help us out with our summer projects in the gardens at Rosa Parks and Buchanan Mall. The day, which started out chilly and overcast, brightened up just in time for the start of the workday! During introductions, the two teams got to know each other with a creative icebreaker that tested both a person’s observations and descriptive skills as well as their artistic ability. In pairs of two, each person was asked to describe an object in nature to their partner who, in turn, was asked to draw the object being described to them. This exercise, one we also use in garden classes to help students focus and sharpen their own observation skills, often produces some interesting — and in some cases, entertaining — pieces of artwork. Following introductions, the large crew was broken down into two task forces. The first team headed over to the gardens at Rosa Parks Elementary School, where in-school garden lessons are taught. 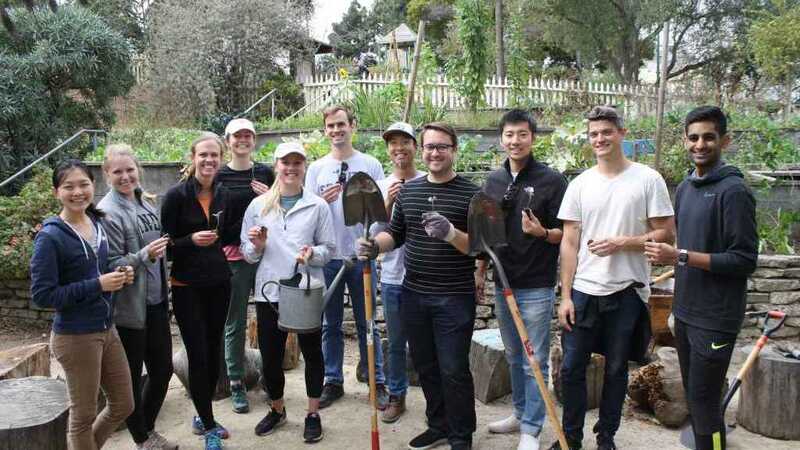 During the course of the day this team harvested vegetables, weeded the garden beds, turned the compost bins, and helped with general maintenance and planting projects. And they did an awesome job! The other team remained at Buchanan Mall working on beautification projects. In addition to planting, weeding, watering, and picking up trash, this team also created journals for the students who will be joining us for the summer session. Students use these journals to draw and label plants and to reflect on their time in the garden. 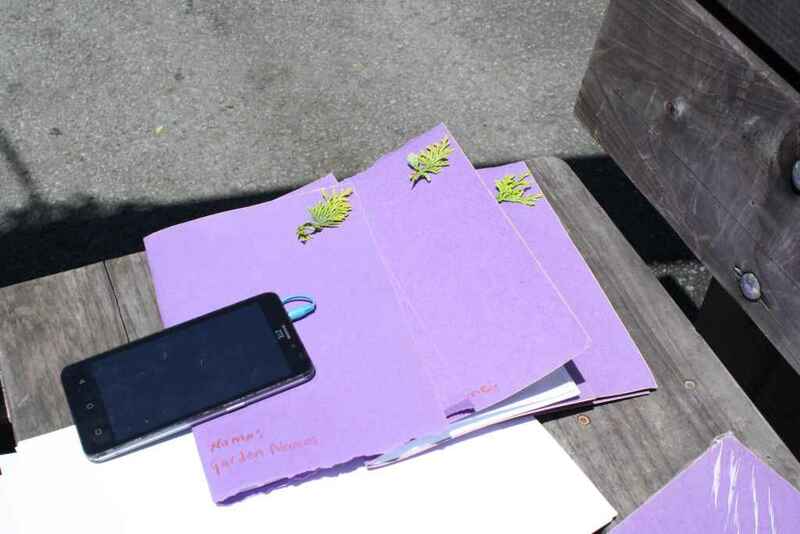 The volunteers even added their own creative flair to the journals, taking clippings from the nearby plants to make the journals special for the students. Everything looked beautiful! 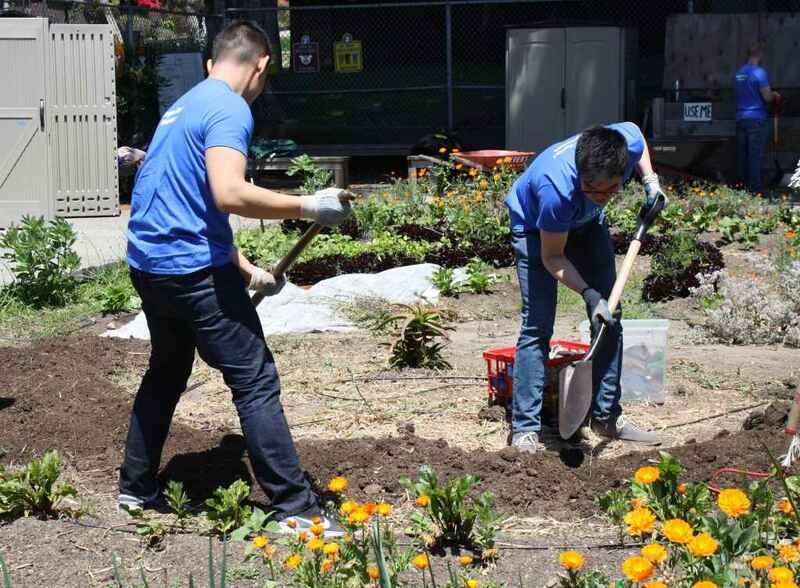 In addition to their time and energy in the garden, Morgan Stanley also raised funds for our BEETS (Band of Environmentally Educated and Employable Teens) program. As a group, their donation will go to support and cover the stipend of one BEETS member during the upcoming fall session. 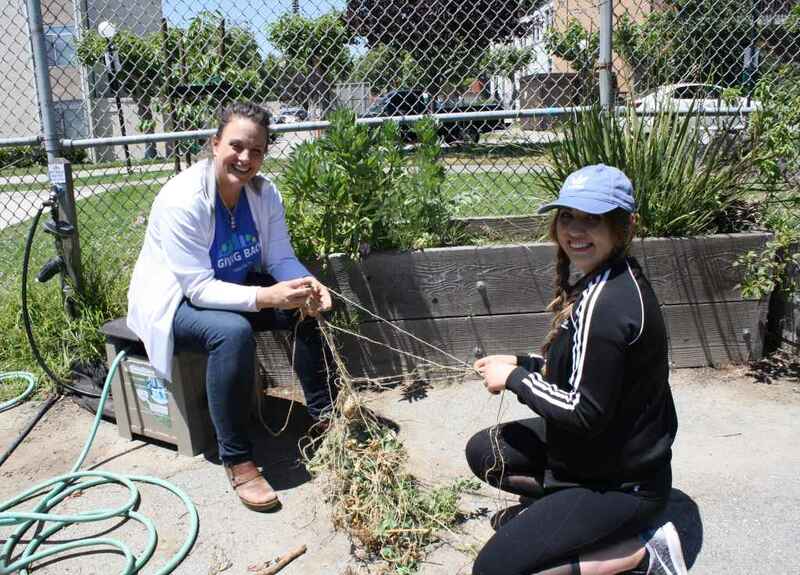 On behalf of the staff at CommunityGrows, we want to thank Morgan Stanley for their support and engagement in both our programs and this workday! The gardens look wonderful, and their actions have set the stage for another great year with our students.